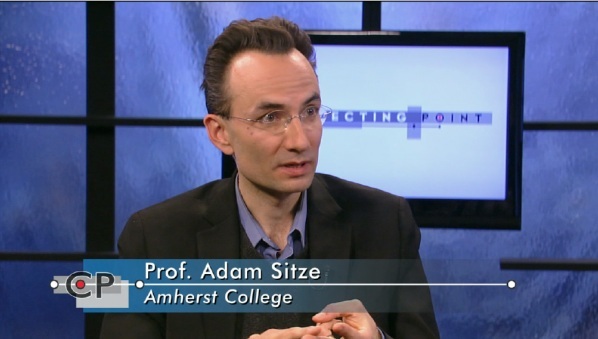 AMHERST, Ma — Amherst College Police have confirmed that Professor Adam Sitze suffered mild injuries yesterday on an evening jog while ‘running at top speed’. The police report states that Sitze, author of The Impossible Machine and currently up for tenure, was spotted leaving “The Crisis of Neoliberal Legal Theory” in a ‘bright, neon-colored jacket’. Though he appeared to be running alone, Sitze was wearing a marathon number on his back at the time of the injury. When asked if he was participating in any kind of race or event, Sitze responded: “It wasn’t any particular event. It was, as Badiou would say, The Event.” When asked for clarification, the overbooked LJST professor responded that you would just “have to engage in a sustained re-reading of Agamben and Arendt on their own terms” to get the full picture. Although Sitze admitted that he might have sprained his ankle in the accident, he was happy to report that his hermenuetic lens remains unharmed. This entry was posted in Academia by internationaldesk. Bookmark the permalink.